After winning both Best Play and Best Actor at last night’s Tony Awards, an inevitable adaptation to the screen is in the works for Robert Schenkkan’s LBJ drama All The Way, the story of the 37th president and his screwball buddies road-tripping to Mexico to lose their virginity difficult push for civil rights legislation. 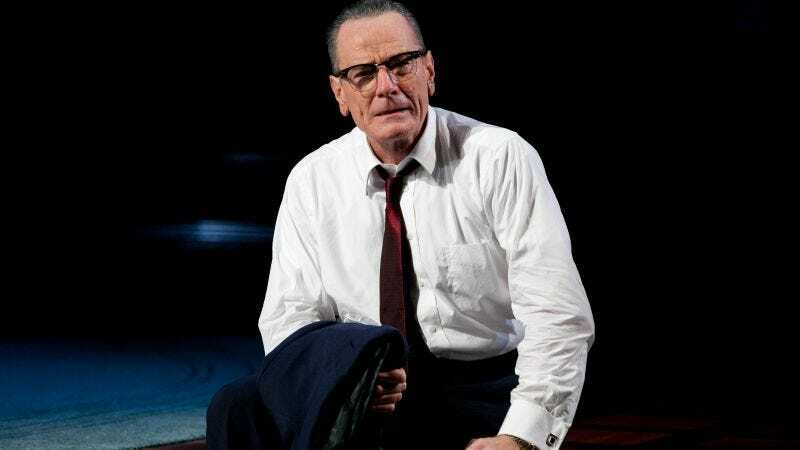 Deadline reports that none other than Steven Spielberg—who explored similar back-room political terrain with Lincoln—is interested in turning All The Way into a miniseries that, like the play, would star Bryan Cranston. And while so far there’s nothing concrete and no network officially attached, with both Spielberg and Cranston’s names in the mix, and the attendant prestige both theatrical and historical, it definitely seems like an easy sell. Those who have been patiently waiting to create a video mash-up of Cranston’s LBJ calling upon reluctant Southern congressmen to join him in cooking meth for the good of our Great Society may not have to wait much longer.